Flash forward and we find Phoenix’s growth to mirror that of its past. Comprised of over twenty cities, the Greater Phoenix area plays host to over 4.3 million people, a number complimented by the millions more who choose to visit every year. With the sun shining 85 percent of its daylight hours, the over 200 golf courses see plenty of seasonal use. 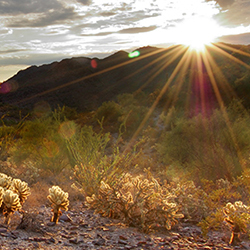 And despite the perceived heat, its location in the Sonoran desert makes it one of the greenest and wettest deserts in North America. For those who prefer to watch rather than play, Phoenix is one of only 13 cities to offer teams in each of the four major professional sports. It has also played host to the Super Bowl on three separate occasions, in 1996, 2008 and 2015. You don’t like sports? Not to worry; the area also offers an extensive array of museums to suit anyone’s artistic or historical tastes. But what Phoenix truly is, is something special. Its diverse terrain of pines, mountain vistas, amazing lakes and powdered slopes (yes, even skiing can be done with only a two-hour drive) are a true taste of what was once known as the Wild West, and offer even the most adventurous a multitude of excursions. It literally provides something for everyone. Yet more important than all that, is its staunch belief in education. Downtown Phoenix is the proud location of the Phoenix Biomedical Campus. This revolutionary campus, which is anchored by the Translational Genomics Research Institute and the medical school, is poised to be the next great academic medical institution. Moreover, it is now home to hundreds of students studying to be the next bright medical minds of the future. The Translational Genomics Research (TGen).